Here’s an interesting statistic for our car owners in Medford, Oregon: Only thirty percent of car batteries make it to forty-eight months. And the life expectancy varies by where you live. It ranges from fifty-one months in extremely cold areas to just thirty months in extremely hot climates. It’s clear that you Medford motorists need to recharge your batteries. This is the job of the alternator. The problem comes when the car’s demand for electricity is high and we are driving in stop and go conditions or short trips around Medford or Jacksonville. The alternator just can’t keep up. The result is shortened battery life. So what can we Medford drivers do to improve our battery’s health? We need to keep the battery as close to a full charge as possible. That can be hard because sitting for just twenty-four hours in hot weather between charges can be too long. When the weather’s cold in Medford, sitting for several days will cause discharge. So some highway driving between Medford or Medford will help keep a full charge if the battery has not been deeply depleted. Car batteries are not designed to be run down really low, or deep cycled, as it’s called. So using your headlights or other power accessories when the car is off can deeply deplete your battery. Using the alternator to recharge from a deeply depleted state is also very dangerous to your battery because it charges too fast. In fact, on average, your battery would only last for ten recharges like that. If you do find yourself with a dead battery or very low battery, use a good quality battery charger to slowly bring the battery up to full charge. Follow the instructions on the charger or talk to your honest Medford Automotive service advisor. Because our batteries are so often at less than a full charge, the experts at Medford Automotive suggest that we use a battery charger from time to time to keep the charge up. They recommend once a month during hot weather and once every three months during colder times. Now, an essential word on safety for Medford car owners. Batteries contain sulfuric acid that can severely burn your skin and could blind you. If you find yourself with a dead battery, carefully inspect it before you jump start it. If the case is bulging, cracked or leaking, do not jump start it. Damaged batteries can explode or catch fire. Deeply discharged batteries can freeze. Do not jump start a frozen battery. At Medford Automotive, we provide quality automotive service including Vehicle Inspections, Preventative Maintenance and Scheduled Maintenance. Hello, welcome to Medford Automotive. Today’s focus is batteries. It seems like everything in Medford runs on batteries. Of course, the batteries we’re most concerned with here at Medford Automotive are those in our customer’s vehicles. Just like the batteries in our smoke detectors or TV remote, car batteries wear out and need to be replaced. There are a couple of things Medford drivers should know when looking for a new battery. Let’s start with cold cranking amps. This can be thought of as the power output used to start a cold Car engine. The number of cold cranking amps you need depends on your vehicle and where you live in Oregon, specifically how cold it is. (Many Oregon auto owners have first-hand experience trying to start their car on a cold winter morning.) The two factors are that the colder your Car’s engine is, the more power it takes to turn the engine over to get it started. It has all that cold, sluggish oil to contend with. The other factor is that the chemical reaction in the battery that creates electrical energy is less efficient when the temperature dips. At Medford Automotive, we consult the table shown below. Let’s say it’s eighty degrees Fahrenheit in Medford. At that temperature, 100% of the battery’s power is available. At freezing, only 65% of battery power is available, but it requires 155% as much power to start the engine as it did at eighty degrees. So if you live where it’s cold in Oregon, you need a battery with more cold cranking amps than you do where it’s moderate or hot. The battery that originally came with your Car was based on averages. At Medford Automotive, we like to remind Medford drivers that they should always get at least as many cold cranking amps as their auto makers recommend, but may want to upgrade if they live where it gets real cold. Now on to reserve capacity: It’s a measurement of the number of minutes of reserve power the battery has at a given load. The number is more important to Medford motorists these days because of parasitic drain. Parasitic drain is the battery energy that’s used when the key is off in your Car. So, the power drawn by the security system, the remote start system, even the power the computers require to maintain their memory. Reserves are also needed when you make very short trips around Medford. You’re not driving long enough for the battery to recover the energy it used to start the engine. So go with the minimum recommended by your manufacturer or Medford Automotive and upgrade if you need more. Talk with us at Medford Automotive about your options. If you need more from your battery, a larger, heavy-duty battery may be called for. At Medford Automotive in Medford, we remind our customers that it’s very important that the new battery fits your Car: the terminals can’t be touching other parts. Batteries are a big ticket item for most Oregon motorists, so the warranty gives piece of mind. There’re two kinds of car battery warranties: pro-rated and free replacement. With the pro-rated, you get a credit for a portion of the battery if it fails during the warranty period. With a free replacement warranty, you get just that, a free replacement. Be sure to ask us at Medford Automotive about the warranty so you know what you’re getting. It’s important for Medford car owners to know battery basics. First, let’s talk about which is harder on a battery – hot or cold Oregon weather. Most Medford car owners think it’s cold weather because that’s when we call on our batteries to have enough power to start a cold Car engine. However, heat does more damage to a battery than cold. Truth is, our batteries start to die a little from day one. Keeping a full charge slows the process, which is hard with short Medford trips because the alternator doesn’t have time to fully recharge the battery from starting the engine. Medford car owners can top off the charge with a computer controlled battery charger – say, once a month in the Oregon summer and every three months during the winter. As far as how long a battery will last, statistics show that 70% have given up the ghost within four years. By that time, they aren’t capable of taking a full charge like they used to, and your Car alternator has to work overtime to keep up. This causes your alternator to wear out early. If you’re pushing 4 to 5 years on your battery, see your honest Medford Automotive technician for a battery test to see if it’s recommended to replace it. Not only can you avoid getting stranded with a dead battery, but you’ll save unnecessary wear and tear on your Car alternator. Hello Medford drivers, let’s talk about batteries. Car batteries are just like any rechargeable battery. They will eventually wear out and die. If you are shopping for a new battery in Medford, here’s some auto advice to help you. The Medford weather also determines the number of cold cranking amps you need. The colder the Car engine, the more power it takes to get it started. Also, cold Oregon weather reduces the electrical efficiency of the battery, which reduces the amount of energy available in the battery to start the engine. Thus, in freezing temperatures, you need more power to start an engine, but you have less power available to get it started. So if you live in a cold climate, or in an area in Oregon where winters can get really chilly, it is important to have a battery with more cold cranking amps than if you live in a more mild or warmer climate. The battery that was installed in your Car at the factory may not have the appropriate number of cold cranking amps for your area. It is important to check the manufacturer’s recommendations and get at least that number of cold cranking amps, but you may want to upgrade if you live in a colder climate. Reserve capacity is the number of minutes your battery can maintain essential functions in your Car without being recharged. There are two things that affect reserve capacity. The first is referred to as parasitic drain. Your Car has power systems that must be kept running while the engine is off. These may include the security system, the remote start systems, and any computer systems. The number and power requirements of these systems has greatly increased over the last few decades. As a result, the need for reserve capacity in vehicles’ batteries has also increased. Very short trips around Medford and Central Point do not allow a vehicle’s battery to recover the energy that was used to start the car. So these trips require reserve capacity as well. Again, the reserve capacity in the battery installed at the factory may not be what you need for your Medford lifestyle and driving habits. Again, use the manufacturer’s recommendation as a minimum, but consider upgrading if your Car has a lot of parasitic power drain or if you frequently make very short trips around Medford. Your honest service advisor at Medford Automotive in Medford can help you choose an appropriate battery for your vehicle and your lifestyle. If you need extra power owing to cold weather or a need for more reserve capacity, you may want to choose a heavy-duty battery. Just make sure it fits into your Car. An oversized battery may give you the power you need, but it’s a serious safety hazard if the terminals come into contact with other parts of the vehicle. Car batteries aren’t cheap in Medford, so you may want to consider the warranty when purchasing. Pro-rated warranties will give you credit for a portion of the battery if the battery fails during the warranty period. The amount of credit will depend on how long the battery lasted. A free replacement warranty will replace your battery if it fails during the warranty period. Before you purchase a battery, make sure you know what you are buying. Today’s report from Medford Automotive is on car batteries, why they die and what we can do to lengthen their life. Most of us have had a dead battery at one time or another. In fact, it would be very unusual if you hadn’t. You may be surprised to learn that only 30 percent of Medford vehicle batteries last for 48 months. Now that’s an average. How long a battery lasts depends on many factors. You may not know that one of the biggest factors is the temperature where you live and drive around Medford. You might suppose that cold weather was harder on batteries because it takes more power to crank a cold engine, but the opposite is actually true. One of the big problems for the way most of us drive in the Medford area, is that our batteries are often partially discharged. The biggest job the battery does is to start the car. It takes some time for the alternator to recharge the battery after starting. If you’re driving short distances, especially if there are several starts and stops, your battery may not fully recharge. Now, as we discussed, heat is hard on a battery. A dirty, greasy battery holds more heat. You can wipe off excess dirt with a paper towel or ask your service advisor at Medford Automotive to clean it for you. Medford Automotive can even test your battery and tell you if it’s time to replace it. Batteries are fairly expensive, so taking a few steps to make them last longer is well worth it. Of course, the battery will eventually need to be replaced. 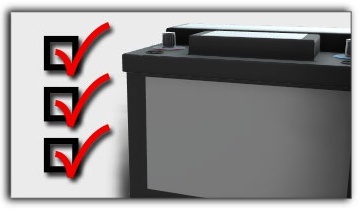 Always make sure you get a new battery that meets the factory specifications for your vehicle. If you feel you need more battery capacity than what came with your vehicle, talk with your service advisor at Medford Automotive about appropriate upgrades.